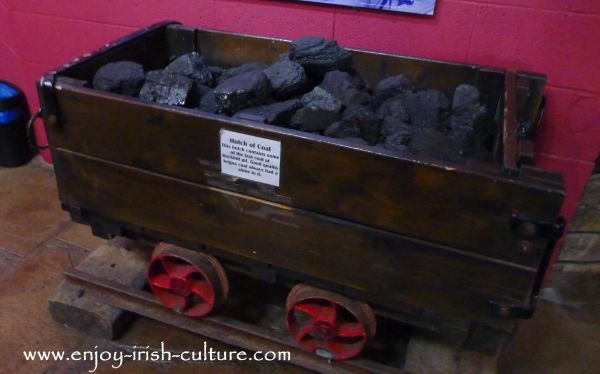 Did you know that there were coal mines in Ireland? 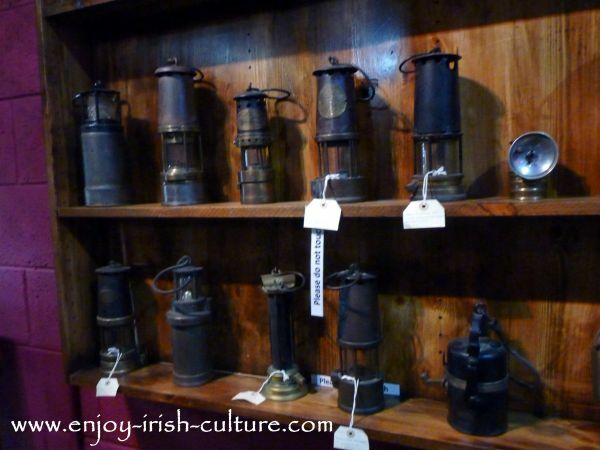 Visiting Arigna in County Roscomon will enlighten you about this allomost forgotten piece of Irish culture. View down the valley from the top of Arigna at the mines. There is a small museum with artifacts from the mines and an audio visual presentation, and you will be brought on an entertaining hour long tour into the former coal mine. The mines are located at the top of the Arigna mountains and are very well signposted. When travelling from Sligo, head for Boyle on the N4. From this point on, it is about a half hours’ drive to the mines. Pass Boyle and keep going following signs for Keadue village. Go through the village keeping left, keep going for about 2 miles looking for a pub called McRann’s where you will turn left. The next left turn will be signposted for the mines. Just follow the signs. The visitor’s centre has a coffee shop that does sandwiches and soup and there is a small gift shop. Tickets for adults are 10 Euros, and 6 Euros for children with family tickets available. The centre closes for two weeks at Christmas but other than that is open all year from 10 a.m. until 5 p.m. with frequent tours throughout the day. Don’t worry about bringing in babies in strollers or being in a wheelchair as the mine has tarmac and is perfectly safe. Our tour guide Michael Early told it as it was working at the mines before they closed in 1990 ending a one hundred year mining history in the area. Like most miners, Michael started working at the mine age 14 with little education. There weren’t many options in this particularly deprived area of Roscommon- you either went to the mines or you emigrated. People were grateful for the employment being there even though the work was incredibly hard. How many people died in the Arigna mines? We asked, and were relieved to hear that only five or six workers died here in one hundred years. Hard to imagine when you visualize what was involved: The mining tunnels in existence nowadays for the tours are tall enough to walk in comfortably, but back in the days of the working mine, the tunnels were so low that miners would be on their knees or in a crawling position for most of their working days. They were mining the shallowest layers of coal in Europe. 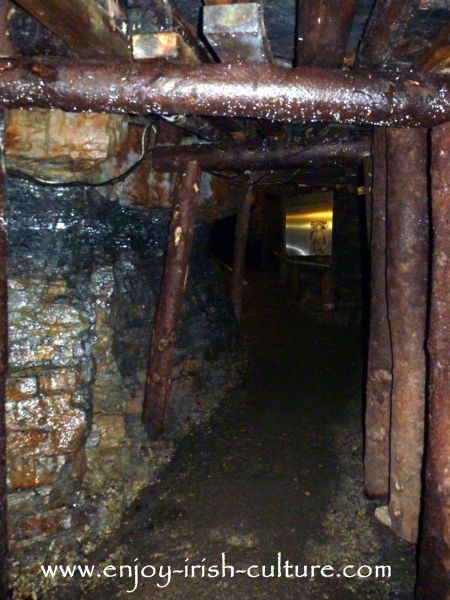 In parts of the mine, they extracted coal in a space 45 cm (less than two foot) high. Depending on the depth of the coal layers in different parts of the drift mine at Arigna, different methods were used to cut the coal loose before being able to bring it outside. One way of loosening the coal was with dynamite. There was a three minute gap between setting up an explosion and the dynamite detonating which is when the men had their sandwiches. They tended not to take an actual break as they wanted to ‘get in and get out’. Miners were forbidden from throwing away the last crust of their sandwich as this would attract vermin, but everyone did because the part of the sandwich you were holding would go completely black. There was no place to wash your hands and no toilet. The coal was brought out in hutches like the one above at the museum which ran on rails. In one eight hour shift a miner would fill around 40 hutches of coal with an overall weight of between 8 and 9 tonnes. The men who worked directly at the coal face were paid according to how much they produced. Although it has never been surveyed, many miners are convinced that the mountain has been slowly collapsing in on itself over time. They could tell from the timbers that were inserted to keep the tunnels open. See on the photo below how this was done. Working together in the Arigna mines created a close bond in the community. Their Catholic beliefs were central to this bond. 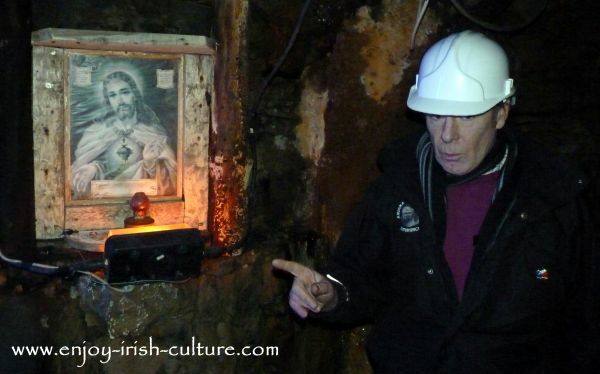 Every morning before entering the mine, miners would stop at the sacred heart lamp (see it on the photo below) and say a prayer to ask for safe return. After the closure of the mines, the Arigna Mining Experience is now providing an income for the community. Fair play to them for showing us their world. We loved being part of it. 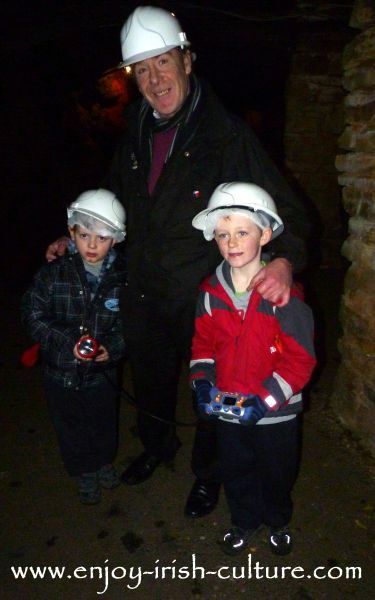 The Mines are in our top five tourist attractions in county Roscommon. They are accessible all year and the tour is an impressive experience for the whole family. We went with our kids and they loved it. Cillian was still talking about it three weeks later. The Mining Experience is pretty much a full day excursion, once you take into account getting there, plus having dinner or a picnic someplace. 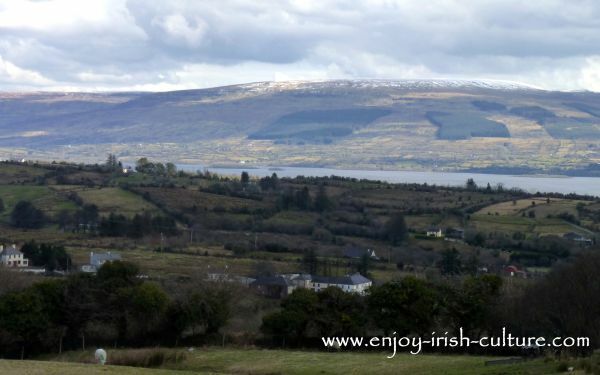 If you have time left, combine it perhaps with a walk for a couple of hours such as at the beautiful Lough Key Forest Park near Boyle. Or indeed, you could pay into the adventure park and let the kids play on the playground there while relaxing over coffee. Not a bad idea huh?! If you are in the area for longer than a day, check out some other great places to visit in the blue box above! Hope you enjoyed our article! If you like what we do on this website, please support us with a social shout out! You can use the handy social buttons we provide at the top left and at the very bottom. Thanks a million and warmest regards from Ireland from Susanna and Colm.